PRETORIA, September 14. /TASS/. 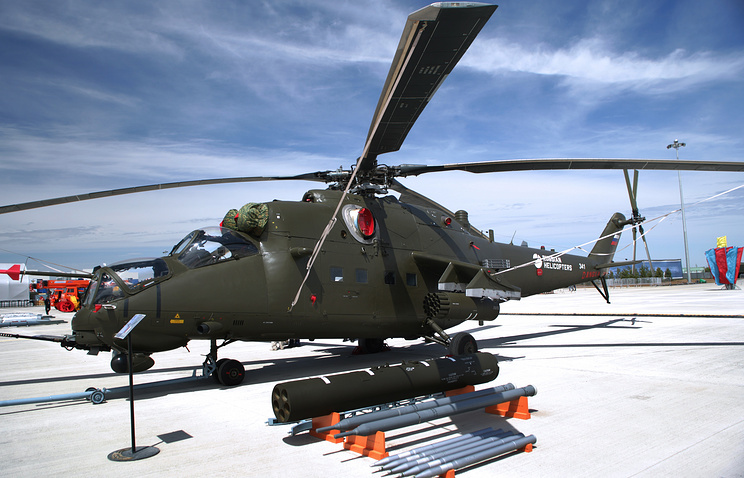 In 2016-2017, Russia will export the Mil Mi-8/17 and Mi-24/35 helicopters to Angola, Mali, Nigeria and Sudan, said Yury Demchenko, the head of the delegation for Russia’s arms exporter, Rosoboronexport, to the Africa Aerospace & Defense Expo, which opened in the South African Republic on Wednesday. Demchenko pointed out that helicopters remained one of the most sought-after types of military hardware in Africa. In 2014-2016, Russian-made helicopters were exported to Angola, Sudan, Uganda and Rwanda. “In 2016-2017, we plan to continue exporting these helicopters to Angola, Mali, Sudan, Nigeria. Our position in the African helicopter market is solid, so we are optimistic about the prospects of cultivating it further,” the delegation chief added. Besides, many African countries prefer to purchase inexpensive equipment, and in particular used equipment, the Russian delegation’s head noted. “For example, we export those Mil Mi-8 and Mi-24 helicopters to this region that have gone through major renovation,” he elaborated. According to the official, Russia’s military-technical cooperation with the African countries has been steady on the ascent for the past few years and a number of African countries have already joined the list of Russia’s main trading partners. “By and large the share of Africa in the world export of weapons is relatively small. For instance sub-Saharan Africa accounts for about two percent, but the statistics of Russian weapons sales by Rosoboronexport in Africa showed steady growth for several years. A similar situation can be observed in northern Africa, where a number of countries in recent years considerably built up purchases of Russian weapons to have entered the list of our main partners in the sphere of military-technical cooperation,” Demchenko said. He believes that the African market is very promising for Russia and shows steady growth. To a certain extent this is a result of soaring threats from terrorists and pirates, as well as such problems as drug trafficking and illegal production of hydrocarbons and seafood, he explained. “Besides, African states have been building up their participation in regional and international peacekeeping missions,” he recalled. The weapons show in South Africa, which is being held on September 14-18, is the largest in Africa. According to the organizers, nearly 400 companies from 43 countries are taking part. According to earlier reports, the Russian delegation plans meetings with delegates from more than 25 countries in Africa, as well as delegations from a number of countries in Europe, Asia and Latin America.